Home / Headlines / India / Special Archive / Indians not allowed in restaurant at Kullu ! Indians not allowed in restaurant at Kullu ! Shimla (Vijyender Sharma) : Imagine being denied service in a restaurant in India because you are Indian. No, we are not talking about pre-Independence India as was shown in the Manoj Bajpayee-Raveena Tandon short film last week, but in 2015 India. 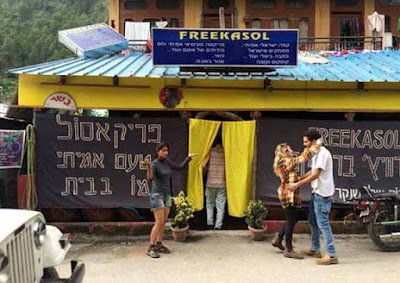 An Indian woman was allegedly not allowed to order food in an Israeli cafe called Free Kasol in Himachal Pradesh. According to a post on Facebook by Stephen Kaye, the owner of FreeKasol, an Indian himself, allegedly refused to give the writer's Indian friend a menu claiming it was a 'members only' cafe. However when Kaye, presumably a foreigner himself, was given a menu when asked. When confronted, the owner stood his ground about not serving them and tried to make them leave. And when they tried to get the attention of other diners, all foreigners, they were ignored, says Kaye. He ends the post by giving the owner's justification of the exclusion, saying that he 'was in a bad mood'. The photograph posted on Monday evening went viral with almost a 1000 shares by Tuesday morning at the time this was being written with people outraging against the restaurant's discrimination on social media. Another friend of the woman who was refused service also took to Facebook to complain about the blatant discrimination. Kasol, is a hill station village in Himachal Pradesh and is a popular tourist destination among Indians and foreigners for its scenic views and natural beauty. Kasol is known as mini-Israel as most hotels, restaurants and the local business banners and boards are in Hebrew and almost all locals can speak the language. It is common to see Israelis roaming the streets all year long. German bakeries, cafes serve Israeli food. The restaurant and the owners haven't given out their version of the story yet.